This little critter's bright, beautiful colors are actually a warning to predators that it's a potent mouthful of poison. Fortunately for Tamriel's humanoid mortals, its venom affects them as no more than a mild hallucinogen. 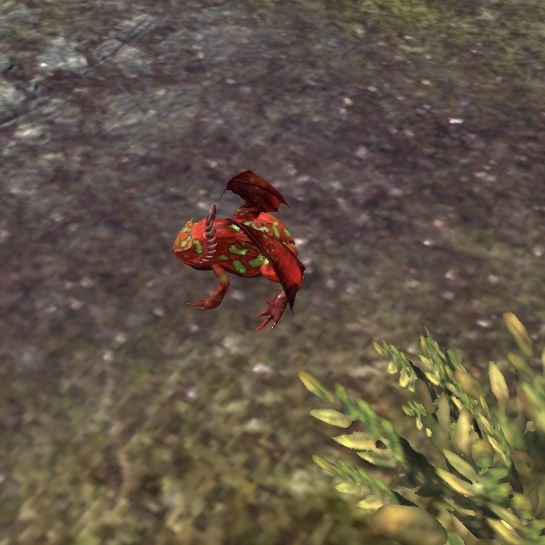 The Kaleidotropic Dragon Frog is available from the Xanmeer Crown Crates as an Epic-level reward. Its default name is "Touch-Me-Not". 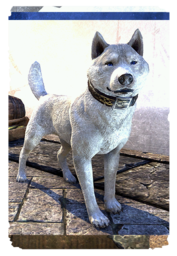 The Karth Winter Hound is the snow-white breed of the Markarth Bear Dog, snowy year-round for hunting in Skyrim's snow-capped peaks. Some Reach clans reserve the Winter Hounds solely for chieftains. 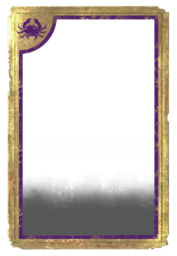 The Karth Winter Hound is an upcoming pet that has yet to become obtainable. Its default name is "Snow Snarl". 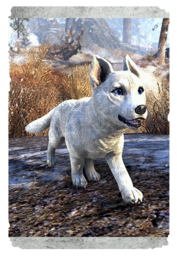 When the Karth Winter Hound has puppies, it even softens the Briarhearts of the Reachmen. Who's a good barbarian pup-pup, then? Is it you? It IS you! The Karth Winter Pup is available as an Epic Reward in Dragonscale Crown Crates. Its default name is "Snowdrift". The Reachmen of Western Skyrim use their domesticated ice wolves to protect their clans' livestock. they also keep the herds healthy, as the Karthwolves themselves will cull out the weaklings. 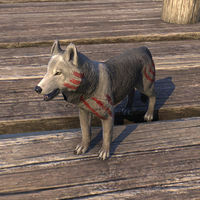 Karthwolf Shepherds are available from the Crown Store for 1000 . Its default name is "Icepack". The common or Kindlespit Dragon Frog is an engagingly preposterous little pal whose antics never fail to amuse. 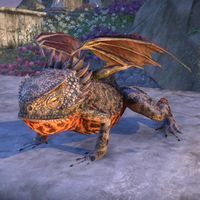 Hammerfell tales say the huge Dragons of ancient legend were all turned into these tiny flame-puffing hoppers. Kindlespit Dragon Frogs are available from the Crown Store. It occasionally breathes fire. Its default name is "Heartburn". 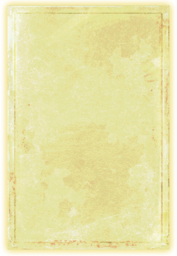 This page was last modified on 2 April 2019, at 01:55.